The colour of the filling was a little odd to look at. 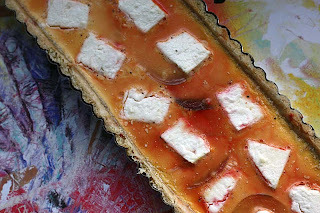 Really I should have crumbled the feta cheese and stirred it into the egg-milk mixture, rather than slicing and topping, but on the plus side I guess I would not have got this accidental psychedelic and mosaic effect. It tasted fine though. The Barabietola di Chioggia beetroot was quite mild compared to the the earthy deep crimson ones. 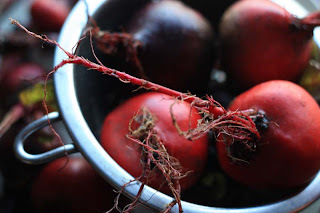 It was really wonderful to use my own home grown beetroot. 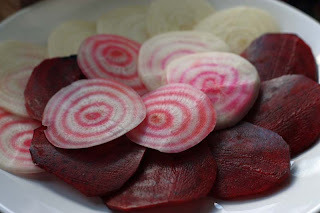 I was especially excited to cut open the Beetroot - Barabietola di Chioggia and marvel at its concentric rings of pink and white inside. It reminded me of those sticker rocks you find at the seaside. I’ve made shortcrust pastry many times with herbs and spices. This time I thought I’d experiment with some freshly grated vegetables, in this case it was with beetroot. The experiment was a success. 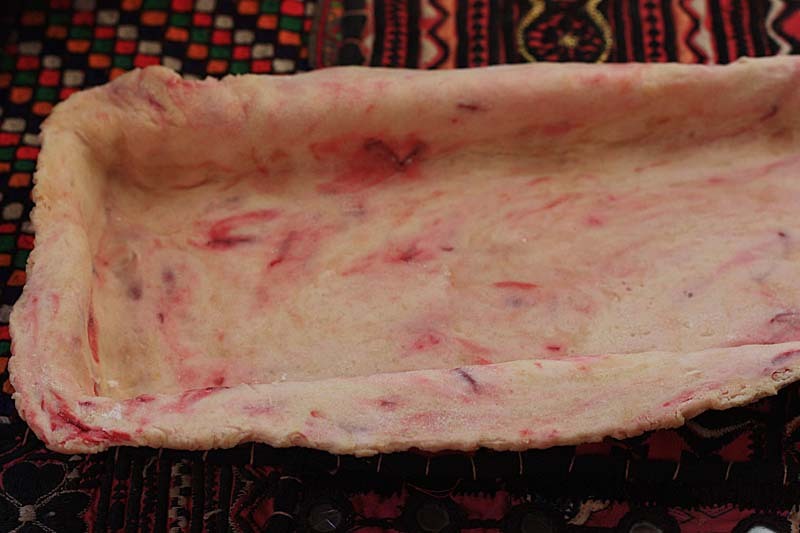 The beetroot created colourful swirls in the pastry pastry and it baked well too. I will certainly be making it again, perhaps with carrots, courgettes, pumpkins and squash. To the mixture add 1 tablespoon fresh beetroot, grated. 2 medium beetroot, peeled and sliced thinly. I used my vegetable mandolin slicer. Blanch the sliced beetroot in boiling water until just tender. Drain and set aside. In a small bowl, combine the milk with the eggs. Stir in the feta and season to taste. 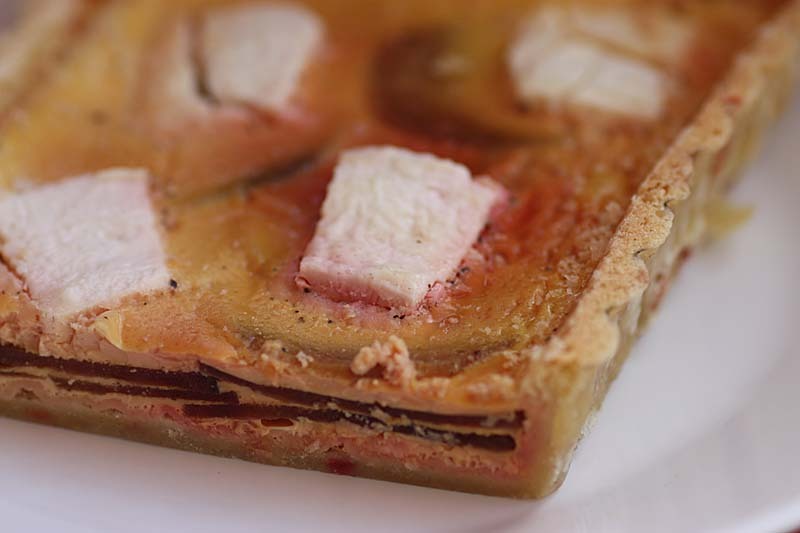 Arrange the beetroot slices on to the pastry case. Gently pour the egg mixture over the beetroot slices. 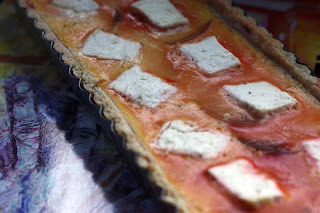 Bake the tart for 30 - 40 minutes, or until the filling is firm and golden in places. Serve warm or at room temperature. I think it's very cool looking! It also sounds tasty, which is a huge plus in my book. That looks so pretty as usual! This quiche looks fantastic! I love the colors in the crust! This quiche looks amazing! Love that you added beetroot to the filling and the crust! that looks beautiful and you've combined two of my favourite ingredients - beetroot and feta cheese. I often make these two into a delicious soup. Thanks for sharing your lovely recipe; I'm such a beetroot fan and I don't know many other people that like it! Thank you so much Charlie. I can't waiti tto try the other vege combinations. Thank you so, so much Mrs Green.